Fort Point in San Francisco is, well, a fort built on a point of land. There's nothing very noteworthy about that. This particular fort was constructed in the mid-1800s - at the height of the Gold Rush and just before the Civil War - to defend the San Francisco Bay. That might seem non-exciting, too but it's actually where things get interesting. Fort Point also a military post that never needed to defend itself. Throughout the Civil War, artillerymen at Fort Point stood guard for an enemy that never came. After that, it was used off and on. It's a wonder it was still standing there when Joseph Strauss started to plan the Golden Gate Bridge. He liked the old fort's history and architecture and designed the bridge to arch over it. 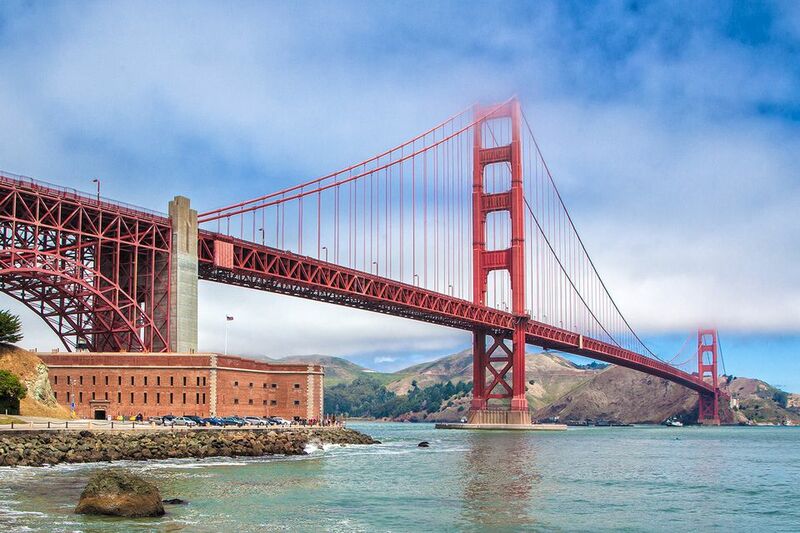 Today, Fort Point sits beneath the south anchorage of the Golden Gate Bridge. It's an interesting piece of the past but the fort seems insignificant compared to the Golden Bridge, towering above it. The most popular thing to do at Fort Point is taking pictures - of the Golden Gate Bridge. You may also catch daredevil surfers who avoid crashing on the rocks - and you might see a sea lion or two. Ships often pass by, too - on their way to and from the Port of Oakland. You can also go inside the old fort building, and admission is free. You might think you don't want to do that, but this is one of those cases where you should do it anyway. Walk to the rooftop and you'll be just below the bridge. In fact, it seems so close that you could almost reach up and touch it. You won't get views of the bridge from anywhere else quite like the ones here. You can also take tours of Fort Point. Rangers give evening candlelight tours, stage cannon drills, and annual Civil War reenactments. Local runners use the fort as the turn around point for their route. And they often give the fence a "high five" before turning around to run back toward the city. Noticing that, one of the bridge's ironworkers put up a plaque with two hands on it for them to slap. It's like a little permanent, double-handed "high five" for anyone who needs it. They're called Hopper's Hands, named after Ken Hopper who first had them put up. And if that isn't charming enough, there's another plaque below with two dog pawprints for their canine running buddies. Movie buffs may recognize Fort Point from a pivotal moment in Alfred Hitchcock's Vertigo. It's the scene where Scotty rescues Madeline after she jumps into the Bay - something we don't recommend trying to re-enact. Fort Point is the turnaround destination for the walk from Crissy Field to the Golden Gate Bridge. And even if you aren't running when you reach the end, you can still slap those hands before you start your walk back. Fort Point National Historic Site is located at End of Marine Drive in San Francisco, CA. San Francisco Muni 28 and 29 bus routes stop at the Golden Gate Bridge toll plaza nearby. Follow the trail signs northeast of the plaza area to Fort Point at the base of the bluffs. The fort and visitor center are open most days of the week. When it's closed, you can still go there to see the bridge. The parking area is open until after sunset, but park rangers close the gate after it gets dark.